I had a good land starting hand and played an early Crawlspace, Nihil Spellbomb and Maze of Ith. Lucifer ramped a lot and played Jenara, Asura of War and a Greater Good. Lyzolda smacked something with a Flame Tongue Kavu and played some discard rats. Sisay played a Karametra, Twilight Drover, and Nullmage advocate, which was scary to me as I had built up a Cloud Cover, Propaganda, and Dreamstone Hedron that I wanted to keep around. 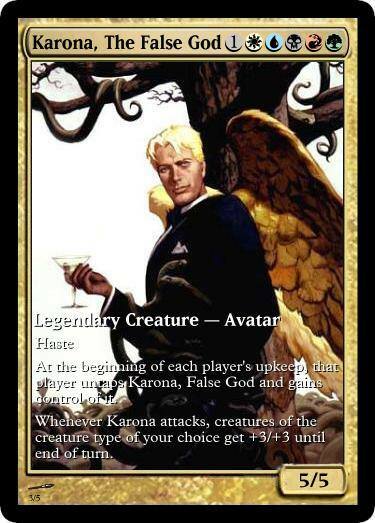 Keranos played an Akroma’s Memorial, and Karona played an actual Akroma, as well as a True Conviction and Light Within. I made my move to try to win the game, casting Lim-Dul’s Vault and digging 35 cards down to find the second half of the Sanguine Bond/Exquisite Blood combo to try to deal with Keranos and especially Karona (who had a ton of life), but Karona flashed in a Pernicious Deed to blow up one of my enchantments in response to the casting of the other one. Sisay was hanging around at a miniscule amount of life, and Lyzolda played a Void for 8 to get rid of Akroma. 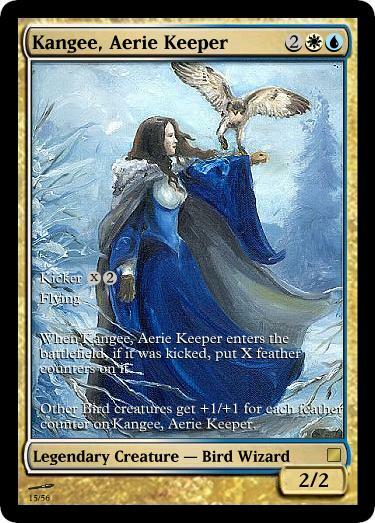 I tried for a Storm Herd, but my tokens could do nothing against Karona who had played an Avacyn and Empyrial Archangel. About the Deck: I know Oloro kind of gets a bad rap, but I did like the idea of playing a “creatureless” Oloro deck, where the goal is not to ever even cast the General (I know this isn’t original). I took the stock pre-constructed deck, pulled out all of the creatures and replaced them with other life-gain/life payment spells. It plays Test of Endurance, Exquisite/Bond, and Storm Herd as potential win conditions. There are almost no counter-spells and not too many board-wipes.